Today i received "Water for Elephants" which has been on my must obtain list of books. I want to read it already!! Although I am sustaining myself due to the fact that I am on Chapter 11 of the top book Harry Potter and the order of the phoenix. So far the 5th HP book is pretty good although I still stand by my earlier conviction that the 4th HP book is by far my favorite. 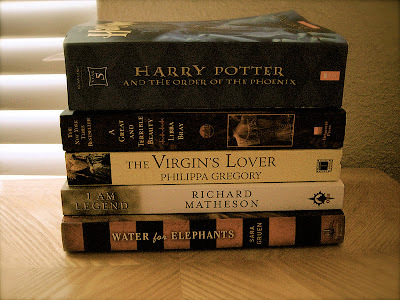 So much reading is on my list, can't say that i don' plunge into things when I make my mind up to doing them. I have now found myself amid 2 Book Clubs, at least 4-5 Book Blogs not to mention all the interesting challenges I will be bestowing upon myself. Speaking of Challenges there is a great one starting .....click the link for details! I am sure that my stack of reading is going to get ALOT longer with this new challenge not to mention if my 2 book clubs decide on the books they want to read for September. With one group its a toss up between The Kite Runner and The Graveyard Book I wouldn't mind reading the graveyard book but voted for The Kite Runner beings I can not only get it on paperback swaps site, but it was also on my TBR list. So I might be skipping that book if graveyard is chosen we shall see. Until then....Happy Reading an Blogging All! !